You did your research thoroughly, dressed to impress and the interview seemed to go really well. After all the stress and nerves you felt before the meeting, you might think that the hard work is now over and it’s time to relax. Although you may have done the hardest part, there’s still more you can do to help land that dream role. It’s important that you don’t rest on your laurels and wait for that job offer to arrive. By being proactive and showing your potential employer how keen, eager and passionate about their role you are, you’ll keep yourself at the forefront of their mind. So here are some post-interview tips to help you stand out from the crowd. You never know, they could make the difference between landing the job and missing out. There’s nothing worse than fretting and worrying as you wait for a decision, so it’s helpful to get an idea of when one is likely to be made. At the end of your interview, thank the interviewer and ask when you’ll hear from them. If they’ve got more people to see or some annual leave coming up you’ll know there’s likely to be a delay before you receive any news. Before you leave, make sure you’ve got the job titles and contact details of the interviewers. This will allow you to send a follow up email. You’ll be surprised how many candidates don’t do this, but a sincere note to say thank you demonstrates maturity and a genuine interest in the role. It will also portray you in a positive light and keep you in the employer’s thoughts. If you’re applying through a recruitment agency, make sure you check with your consultant before you liaise with the employer directly. Some agencies will prefer all communications to come through them. In this case, you can ask your consultant if they wouldn’t mind forwarding your message on to the employer. Keep it brief: Your follow up message should be no longer than three short paragraphs of two or three sentences. Make sure it’s personalised with the recruiter’s name. Send it promptly: Ideally you should email within 24 hours of your interview. Thank the recruiter: Your opening line should express gratitude for the opportunity to meet and reiterate your interest in the role. Reinforce your skills: Remind the recruiter of your strengths and how they would benefit them. You could also mention any other information that’s relevant to the role or answer any questions you couldn’t during the interview. Make yourself available: Let the interviewer know you’re available to answer any questions or provide further information. Check before sending: Once you’ve composed your message, read it carefully to make sure your spelling and grammar is correct. You should also ensure you keep the tone professional and avoid any negative comments. 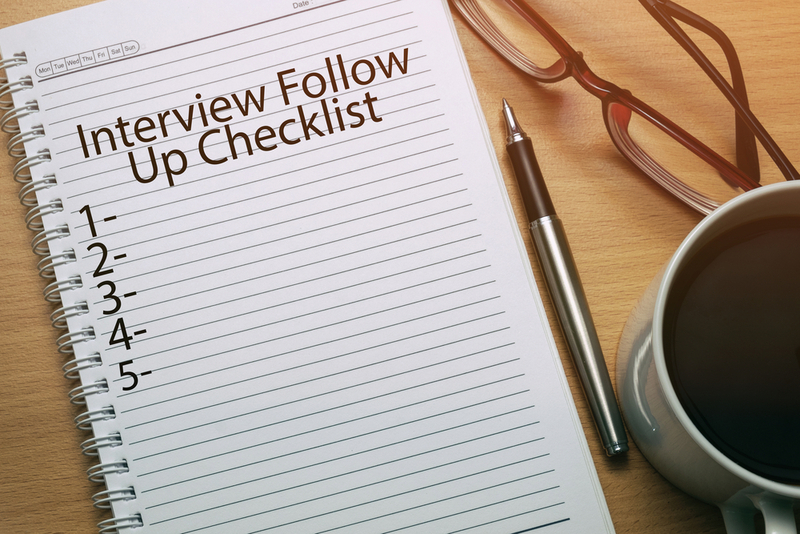 It’s likely you’ll have been told whether there will be a second stage to the interview. If you are invited back for a second meeting, make sure you have questions lined up to ask, as you would in any first interview situation. Finally, no matter how well the interview went or how confident you’re feeling, you should continue to look at and apply for other openings. It’s unwise to put all your eggs in one basket, so make sure you don’t miss out on another exciting opportunity by assuming a job is in the bag. If you’re not successful, try not to be too disheartened; ask the employer for constructive feedback and take their response on board for next time.